20 September 2018; FOREO, the Swedish beauty and wellness brand that surpassed 1 billion USD in revenue in 2017, has announced its participation in the 2018 edition of Tax Free World Association (TFWA) World Exhibition and Conference. They’ll be showcasing the award-winning LUNA mini 2 facial cleansing brush and revolutionary UFO smart mask, alongside an exciting range of new gift sets created exclusively for travel retail. Already hugely popular with global travellers FOREO has added 30 new store openings to its international travel retail portfolio since the beginning of 2018, boosting its tally to almost 200 placements worldwide. Scheduled to take place from 30 September through 5 October 2018, the TFWA World Exhibition and Conference is a highlight of the travel retail calendar. Attended by a Who’s Who of the sector’s key operators, suppliers and brands, the annual event is slated to draw more than 12,000 industry professionals to the iconic Palais des Festivals on Cannes’ famous seafront promenade. FOREO will be a highlight of this year’s Fragrance and Cosmetics category, where the brand will introduce the UFO smart mask. Launched beginning 2018, this game-changing device places spa-level treatments quite literally in the palm of users’ hands. Compatible with a range of seven specially developed UFO-Activated Masks, technologies include warming thermotherapy, cooling cryotherapy, full-spectrum LED light therapy, and T-sonic pulsations. For use with the recently launched FOREO For You app, it delivers visible results in just 90 seconds. Another of FOREO’s star products to be presented at this year’s TFWA World Exhibition and Conference is customer favorite, LUNA mini 2. The rechargeable silicone facial brush has picked up a host of accolades and awards internationally, most recently TR Business Magazine’s Travel Retail Award, the industry’s first to be voted for by shoppers themselves. The facial cleansing brush is especially popular among China’s growing number of outbound travelers. In 2017 on the country’s unofficial shopping day, Singles Day, the cleanser ranked number two on online retail site, TMall - second only to the just-launched iPhone 8. Testament to FOREO’s appeal in China and beyond, the brand racked up sales of a more than $15million in the one-day event. Finally, the Swedish brand will present an attractive new range of travel retail sets, comprising exclusive product combinations, as well as festive gifts for the upcoming holiday season, and into 2019. Recent years have seen tremendous growth in the travel retail industry, with sales expected to reach $125 billion by 2023. Always at the forefront of its industry, FOREO continues to innovate to cater to this channel and the intensified demand for beauty products. In the first half of 2018 alone, FOREO added a further 30 travel retailers to its portfolio, taking its global tally to almost 200 placements. Accounting for sales of almost 4 million units globally, they span 22 countries including airports in New York, Los Angeles, Paris and Sydney, and partners such as Dufry, The Shilla, DFS, and Lotte Duty Free. 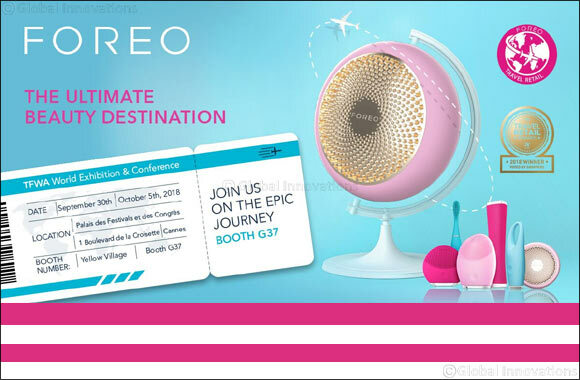 FOREO invites all travel retail colleagues attending the TFWA event to visit booth number G37, Yellow Village, Cannes Palais des Festivals.